Power Management Company (PMC) in conjunction with Melink Solar of Milford, Ohio completed construction of a 1.07 MW ground-mounted solar array in Rochester, Massachusetts. 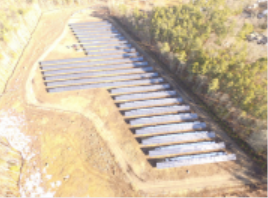 The solar array was constructed off Snipatuit Road in Rochester on land identified by Whelan Associates of New Bedford, MA, a leading supplier of commercial real estate services including development, construction and property management. The project is owned by IGS Energy, an independent energy supplier. Power Management offered a turn-key solution that included the design, construction and management of the solar array. The original parcel of land located in Rochester, MA encompassed 110 acres. It was determined that the solar development project would span a 10 acre area. In the spirt of the green effort and prudent land management practices, the remaining 100 acres were donated to the town for open space and recreation. Southern New Hampshire. In total, the project consisted of installing 3,420 ground mounted solar PV modules across the 10 acre parcel.